Who doesn't love a cute pair of high waisted shorts? I picked up these adorable powder blue ones from Nordstrom a few months back and I'm so excited that its finally warm enough to wear them! These shorts are incredibly comfy but also super trendy. I love the pleats and high waist! There are many ways to style these, here I went with a simple white tee however you could also do a tank top or even a looser fitted cami for a different look. If these came in other colors I would hands down buy them in every color. Unfortunately these are sold out but I have linked a few other pairs. I also want to take a moment to talk about my tassel earrings. I recently discovered that Baublebar has a line for Target! The line is called Sugarfix by Baublebar and everything is super reasonable. I found they had so many styles similar to the Baublebar earrings I have seen in Nordstrom however, for half the price! These earrings I am wearing come in a variety of colors ( I also bought the red pair). With a price tag of 12.99 (however currently on sale for 10.39! ), I find these to be a steal and the perfect way to add a little flair to your outfit and make a statement. 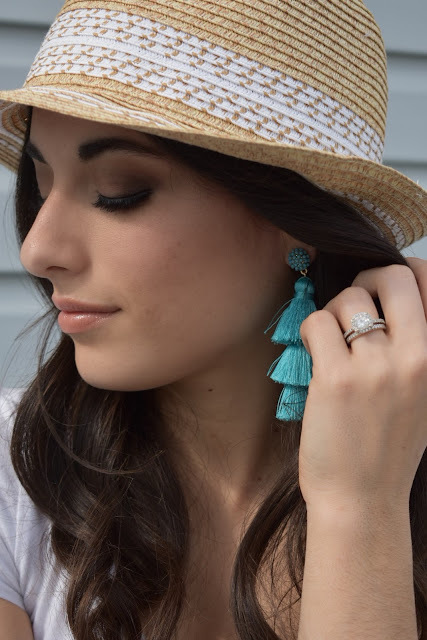 Do you like bold earrings? Tell me what you think of this Spring trend!